Americans hold diverse views about global warming, falling into six distinct groups – Global Warming’s Six Americas – that range in their climate beliefs, attitudes, policy preferences, and behavior. The group most engaged in the issue is the Alarmed, who are very worried about the issue and strongly support government and individual action to address it. At the opposite end of the spectrum are the Dismissive, who do not believe global warming is real and are likely to believe various conspiracy theories about the issue (e.g., it’s a scientific hoax). In between, with different levels of knowledge, interest, and concern are the Concerned, Cautious, Disengaged, and Doubtful. In 2017, we conducted a representative survey of Latinos in the United States. Here we identify Global Warming’s Six Americas within three groups: non-Latinos, English-language Latinos, and Spanish-language Latinos. We find that Latinos in the U.S., particularly those whose language of choice is Spanish, are more Alarmed and less Dismissive than non-Latinos.All Latino survey respondents were given the option to take the survey in English or Spanish. Non-Latino respondents are from the May 2017 Climate Change in the American Mind survey conducted at the same time and using the same platform as the survey of Latinos. Specifically, only 18% of non-Latinos are Alarmed, compared to more than twice that percentage of Spanish-language Latinos (37%) and 29% of English-language Latinos. When combined with those Concerned about global warming, about three in four Spanish-language Latinos (77%) are either Alarmed or Concerned as are two in three English-language Latinos (66%). In comparison, only half of non-Latinos (50%) are either Alarmed or Concerned. At the other end of the spectrum, one in ten (10%) non-Latinos are Dismissive, compared to 6% of English-language Latinos and only 1% of Spanish-language Latinos. When those Doubtful about global warming are added, one in five non-Latinos (20%) are Dismissive or Doubtful of global warming, compared to 12% of English-language Latinos and only 3% of Spanish-language Latinos. Although the Alarmed is the group that is most engaged in the issue, many Alarmed Americans are not yet taking political action to reduce global warming. In this research note, we focus on the Alarmed and highlight the similarities and differences between Alarmed non-Latinos, English-language Latinos, and Spanish-language Latinos in their willingness to take political action on global warming and the barriers that keep them from doing so. 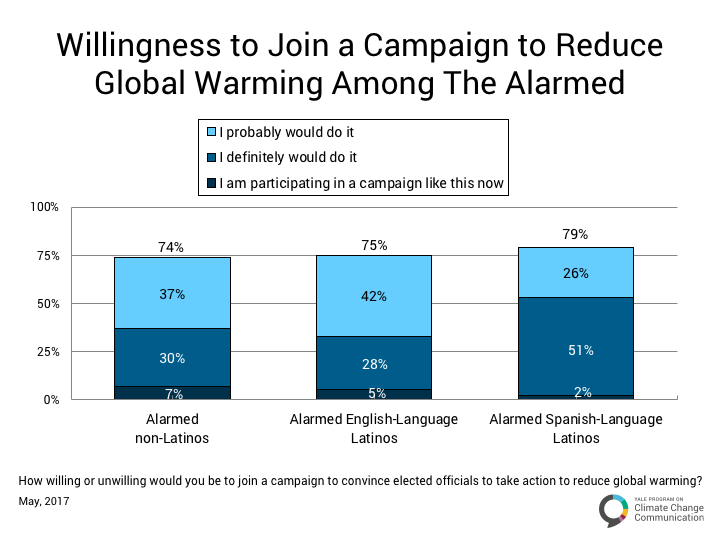 Similar percentages of Alarmed non-Latinos (74%), English-language Latinos (75%), and Spanish-language Latinos (79%) would join, or are currently participating in, a campaign to convince elected officials to take action to reduce global warming. However, while approximately equal proportions of Alarmed non-Latinos (30%) and English-language Latinos (28%) would “definitely” join a campaign, more than half (51%) of Alarmed Spanish-language Latinos say they would definitely join a campaign. Alarmed Latinos and non-Latinos have similar motivations for reducing global warming. 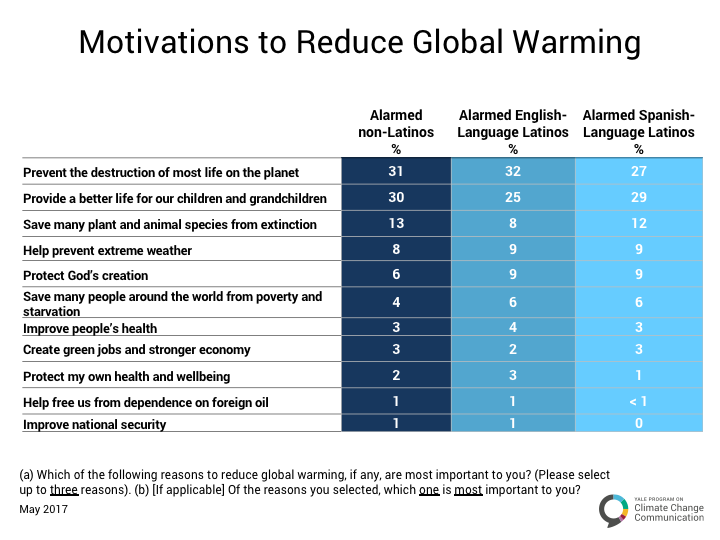 The top reason for Alarmed non-Latinos (31%) and English-language Latinos (30%) is preventing the destruction of most life on the planet. Their second most important reason is providing a better life for our children and grandchildren (30% and 25% respectively). The order is reversed for Alarmed Spanish-language Latinos, with 29% saying providing a better life for our children and grandchildren is the most important reason to reduce global warming and 27% saying the most important reason is preventing the destruction of most life on the planet. 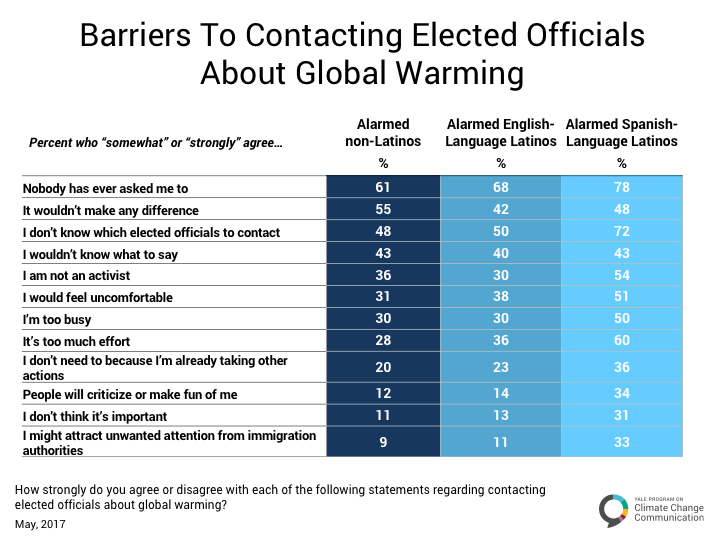 Alarmed Latinos face different barriers to contacting elected officials about global warming than do Alarmed non-Latinos. The top barrier for all three groups is that nobody has ever asked them to contact their elected officials, although this is a more prevalent barrier for Alarmed Spanish-language Latinos (78%) than Alarmed English-language Latinos (68%) or Alarmed non-Latinos (61%). About seven in ten Alarmed Spanish-language Latinos (72%) say they don’t know which elected officials to contact, while only about half of Alarmed English-language Latinos (50%) and Alarmed non-Latinos (48%) say they don’t know. One in three Alarmed Spanish-language Latinos (33%) say they might attract unwanted attention from immigration authorities, compared with about one in ten Alarmed English-language Latinos (11%) and Alarmed non-Latinos (9%). On the other hand, more Alarmed non-Latinos (55%) than Alarmed English-language Latinos (42%) or Alarmed Spanish-language Latinos (48%) say that contacting elected officials about global warming wouldn’t make any difference, suggesting non-Latinos may be more fatalistic or cynical about the political system. About equal percentages of Alarmed non-Latinos (43%), Alarmed English-language Latinos (40%), and Alarmed Spanish-language Latinos (43%) say they wouldn’t know what to say if they contacted an elected official. Despite the willingness of many Alarmed Americans to join a campaign to reduce global warming, a large percentage of them have never been contacted by an organization working on the issue. 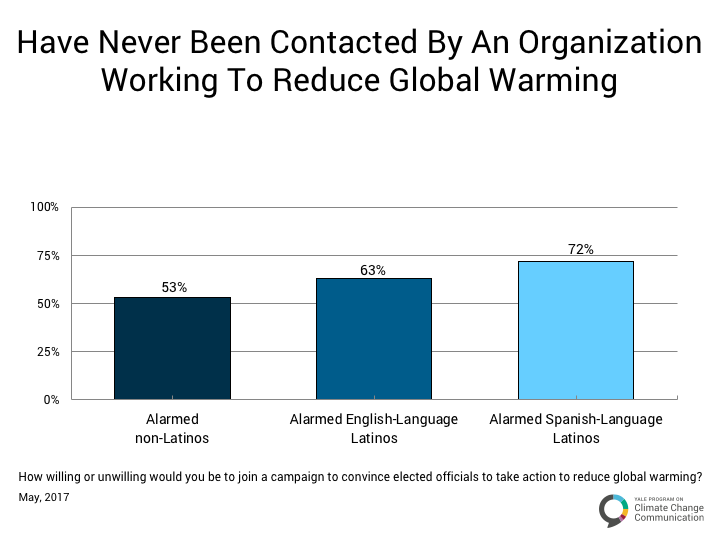 About half of Alarmed non-Latinos (53%), six in ten Alarmed English-language Latinos (63%), and nearly three in four Alarmed Spanish-language Latinos (72%) have never been contacted by an organization working to reduce global warming. The survey of Latinos (including both English- and Spanish-language Latinos in the United States) was conducted May 18 – June 8, 2017. Interviews: 2,054 Latino adults, including 377 English-language Alarmed (margin of error, plus or minus 5 percentage points) and 295 Spanish-language Alarmed (margin of error, plus or minus 6 percentage points). All questionnaires were self-administered by respondents in a web-based environment. Respondents chose whether to take the survey in English or Spanish. The survey took, on average, 27 minutes to complete. The survey of non-Latinos was conducted May 18 – June 6, 2017. Interviews: 1,266 adults in the United States, 1,140 of whom were non-Latino, including 222 non-Latino Alarmed (margin of error, plus or minus 7 percentage points). All questionnaires were self-administered by respondents in a web-based environment. The survey took, on average, 24 minutes to complete. Only responses from non-Latinos are included in this report. The samples therefore include a representative cross-section of adults in the United States, irrespective of whether they have Internet access, use only a cell phone, etc. Key demographic variables were weighted, post survey, to match U.S. Census Bureau norms. Leiserowitz, A., Rosenthal, S., & Cutler, M. (2018). Latinos and Global Warming's Six Americas: May 2017. Yale University. New Haven, CT: Yale Program on Climate Change Communication. This study was funded by the Heising-Simons Foundation, 11th Hour Project, the Energy Foundation, the Grantham Foundation, and the MacArthur Foundation.